Getting the length (or duration) of your promotional video or video marketing content right is essential to ensuring your target audience actually watch your video in its entirety. Pretty much every time we click play on online video we cast a quick glance to the bottom right of the video window to see what the duration of the video is. If we’re not fully engaged right from the start and the duration is above 2 minutes there’s a strong chance we will click away before watching just over half of the video. Depending on your product and target demographic this critical window of initial engagement time can get shorter – If you’re targeting under 25’s you’d better get the first 10 seconds of your video marketing bang on or your dead in the water. Before we look at the figures its worth mentioning that there are several problems caused by viewers not watching a promotional video right to the end. Firstly we don’t want them to miss any of our key product or service selling points. If a viewer stops half way through they may be missing the piece of information that’s critical to their own purchase decision making process. Secondly, we don’t want the viewer to miss seeing the CTA- which many videos have as their closing message. Finally, google ranks sites with videos that have high levels of “completed plays” higher than those with high video click away rates. So if everyone only watched less than half of our video Google will rank it lower in relevant search listings. So lets look at the stats to see how the length of your promotional video impacts on the average amount of your video that actually gets viewed. It’s not going to be a massive revelation to most people that shorter videos achieve many more “completed plays” than longer ones. We all lead busy lives and if you’re selling B2B then time is always critical so mainlining your message quickly is the most effective way of ensuring that your entire message is received. If your promotional video is under 2 minutes then nearly 55% of every person who hits play will watch the entire video (this sounds low but its actually a good benchmark to aim for). If you’re video runs a little longer there is a drop off in these completion stats but its interesting to note that there is not much variation in completed plays whether your video is 3 minutes or 10 minutes in length. 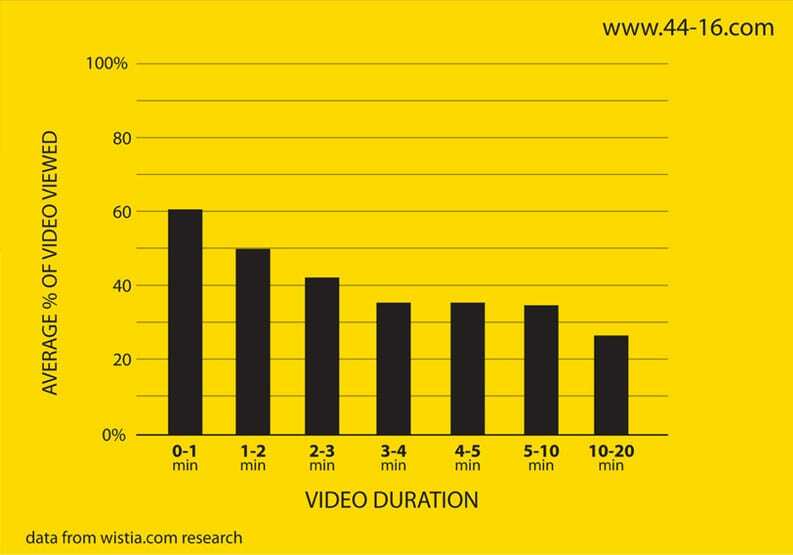 Videos with durations between 3 and 10 mins achieve an average of 37% completed plays. So if you’re video is going to be over 2 minutes, don’t worry if it ends up being 4 or 5 mins as the stats over the 2 min mark are similar. However if you need to present a much longer video of over 10 minutes then the drop off rate is steep with an average of just 27% of viewers reaching the final frame of your video. Obviously some video productions require a longer duration due to the nature of the content and the messaging required. If this is the case then load the key information in the early part of your video to ensure you deliver your key messages before the viewer can click away. A good idea is to have a CTA that appears either throughout the video (in the form of voiceover or text) or to keep repeating the CTA at intervals throughout the video. Think about your video in the way a newsreader would present the news. Start with the main headlines in brief. This ensures you deliver a quick overview of your key values and selling points from the outset. You can elaborate on the detail of these key points in the remainder of your video knowing that you’ve delivered punch and impact at the start. This will not only help encourage viewer completed plays but will ensure that you have delivered the guts of your message to any viewers who do click away. So what can we takeaway from these stats. Well obviously the main point is to be brief. Shorter promotional videos engage viewers and keep them watching. If you’re video marketing content is under 1 minute then it will achieve more than 200% the amount of completed plays than a 10 minute+ version would. Impact is key so strong messages clearly and quickly delivered will produce a powerful video marketing asset and help drive those sales.